January has flown by. Seems like just last week, I was telling you about my plan for detox and sharing a recipe for a Whole30 Italian Wedding Soup. I'm happy to report the detox has gone well! I've been working out 5-6 times per week, and mostly eating a clean diet of meats and veggies, leading to a noticeable change on the scale. Minus a small hiccup when my friends Liz & Ben visited and basically hazed me to drink (ok, so it didn't actually take a ton of convincing), I've also managed to stick to "dry January." Truth be told, it's more like "dry first 3 weeks of January." We have a wedding this weekend, and then off to Jamaica on Sunday to celebrate Justin's birthday, effectively cutting the detox a few days short. Speaking of Jamaica... 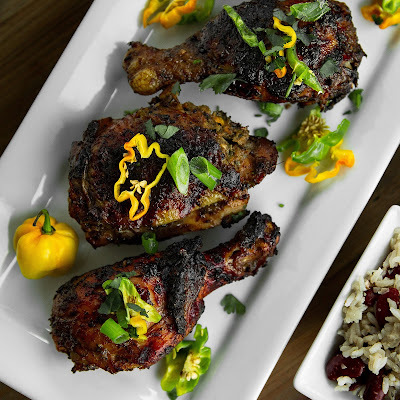 I've been dying for my friend Alexis to teach me her jerk chicken recipe, so this seemed like perfect timing! I met Alexis while working at ESPN. She has a vibrant and infectious personality; it's impossible not to love this Jamaican girl. 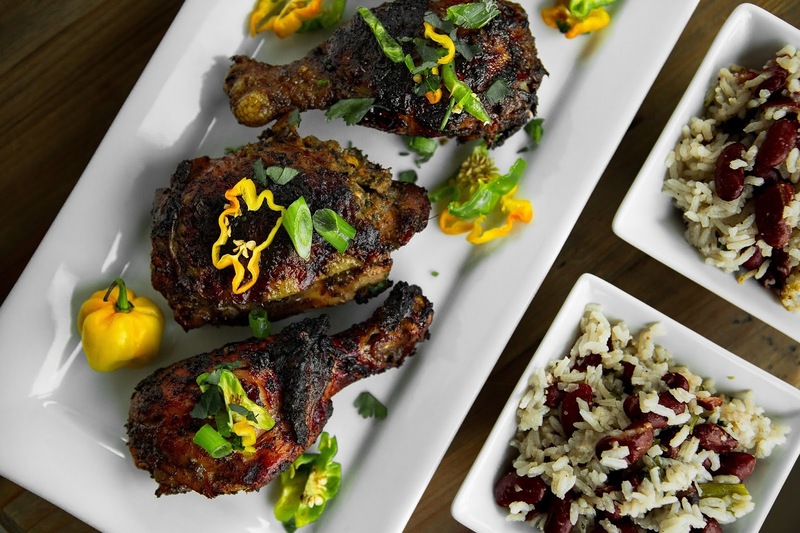 She also makes delicious jerk chicken, which is an added bonus! I'm so glad she not only shared her own personal recipe, but also came to New York to teach me in person. As I was collecting ingredients for our cooking extravaganza, one item on the shopping list was somewhat unfamiliar to me. Scotch bonnet peppers, as Alexis informed me, are literally in everything in Jamaica. Sadly for her, she cannot find them in Connecticut so she often has to sub with habanero, which are similar in heat level, but have less of the "fruity" flavor of the scotch bonnet. 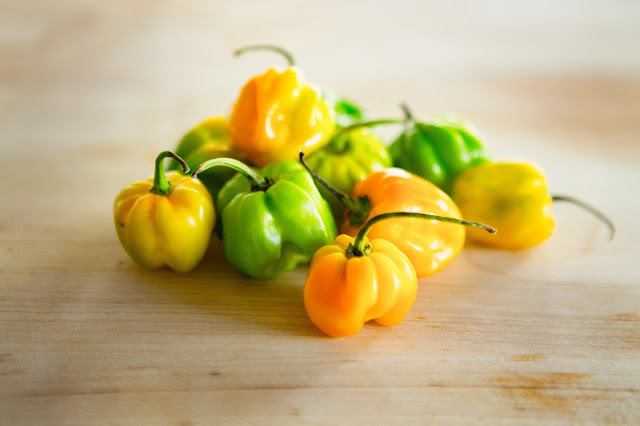 Fortunately for me, I now live in New York and was able to find scotch bonnets at Essex Street Market (they were labeled "Jamaican hot pepper.") Similar to other peppers, they come in green, yellow, orange or red. 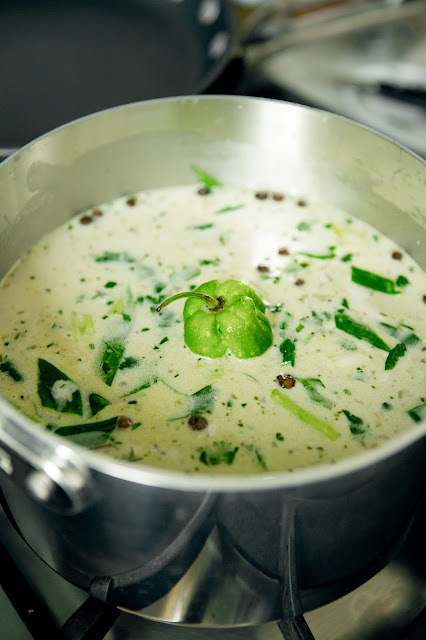 The peppers bring the signature heat to this Caribbean dish, but the marinade is so much more complex than just spice. It also calls for garlic, scallions, onion, fresh ginger, fresh lime juice, brown sugar, allspice (called pimento in Jamaica), cinnamon, nutmeg, thyme, soy sauce and cooking oil. You will find those ingredients in pretty much any recipe online. 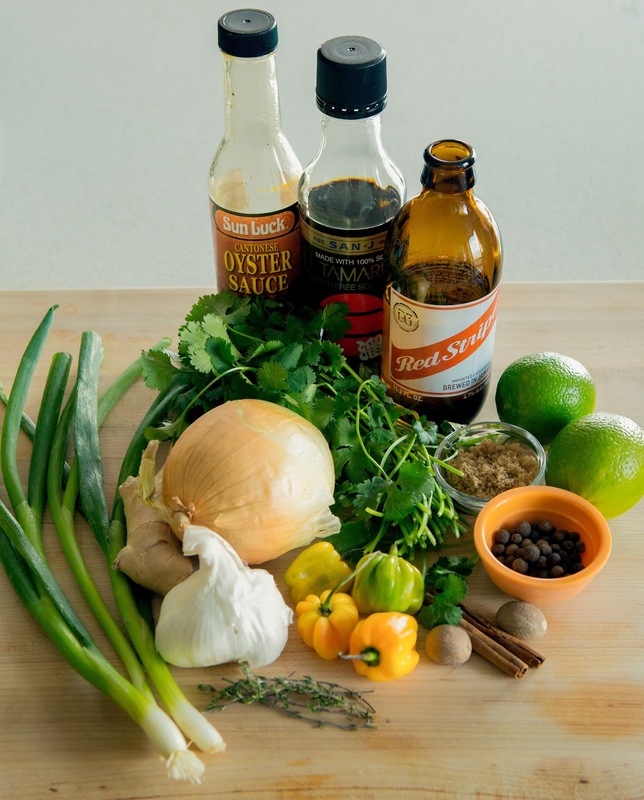 As her own personal twist, Alexis also adds oyster sauce (there is a large Chinese influence in Jamaican cooking, with lots of soy sauce and oyster sauce), cilantro and a little red stripe beer. Feel free to leave them out, but I love all three of those things, so I appreciated an interesting new twist on this Jamaican classic. 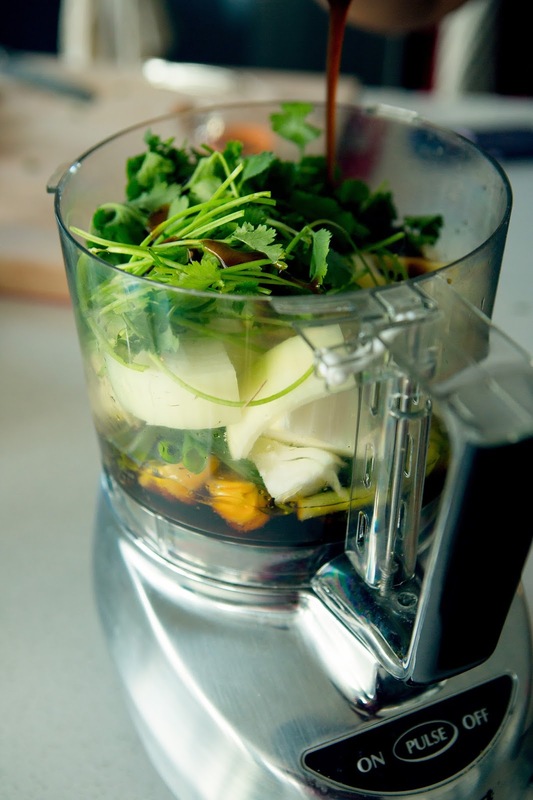 You don't have to spend too much time chopping, as you will pretty much just toss everything in the food processor. A note on the peppers though... each one is different, so it's best to play it conservative and add more as you need. We made two batches, and put 4 peppers in the first and 5 in the second, with the seeds removed in two of the peppers each time. I think we started with 3, and built from there, sampling the marinade for spice level as we went. *If you are not accustomed to working with hot peppers, you might want to wear gloves while chopping and marinating the chicken. Obviously, Alexis and I had no issues with it, just make sure to thoroughly wash your hands and avoid touching your eyes. It will look something like this if you are using the beer (it will be more of a paste if you decide to omit it.) Again, test for seasoning and add more peppers (or salt & pepper), as needed. Now for the fun part. 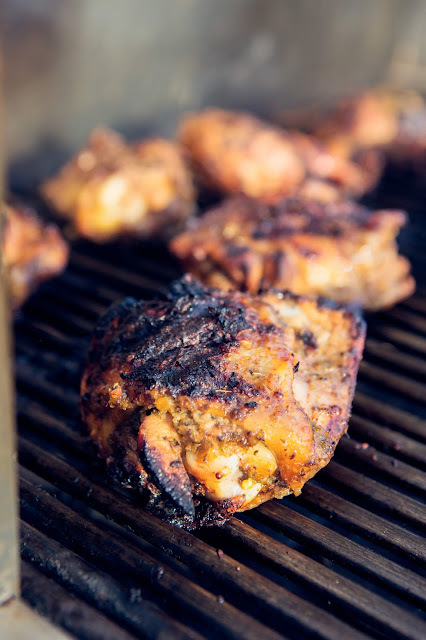 You will add this marinade to approximately 4 pounds of chicken pieces. I bought a 2-pound package of drum sticks and a 2-pound package of bone-in chicken thighs. Bone-in and skin-on is best for flavor and keeping the chicken juicy, but you can substitute for boneless/skinless if you are one of those people who hate meat on the bone. (Don't worry, I'm not one of those people.) Alexis often uses this marinade for jerk hot wings as well, which I plan on making for Super Bowl. *Apologies for the slightly blurry photos. Justin was working this day, so I was running camera for this one. Luckily Justin came to the rescue for editing them! Alexis likes to do a combo of the oven and grill when cooking the chicken. Fortunately for us, it was a decently warm day for January (about 53 degrees), so we were able to utilize the grill on my building's roof. If you would like to do this method as well, bake in the oven for about 30 minutes (skin side up), and then finish them on the grill to get that nice char and smoky flavor. (Also make sure the internal temperature has reached 165 degrees.) In Jamaica, they grill them the entire time, so you can do that if you'd like. OR... if it's too cold for grilling, you can finish them under the broiler to create a bit of a char and crispy skin. If you are making "rice and peas" as they call it (or rice and beans), you can make it while the chicken is in the oven. It's basically all the same flavors from the marinade combined with some coconut milk, rice & red kidney beans (she uses canned ones as a helpful shortcut.) If you would like the recipe for this, comment below and I will type up the recipe! Serve chicken hot with the rice & peas. If you want to get all fancy, you can garnish with additional peppers, scallions and cilantro. 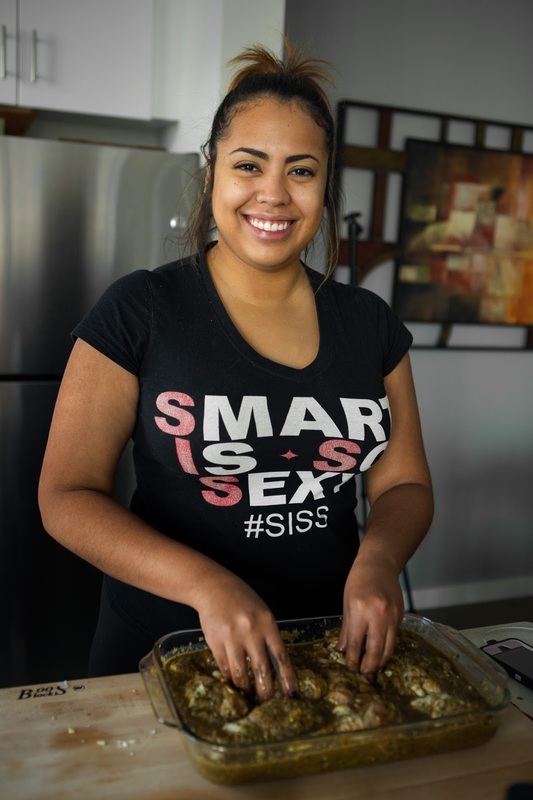 Thanks to Alexis for sharing her recipe! I can't wait to sample some from a roadside spot while in Jamaica next week! 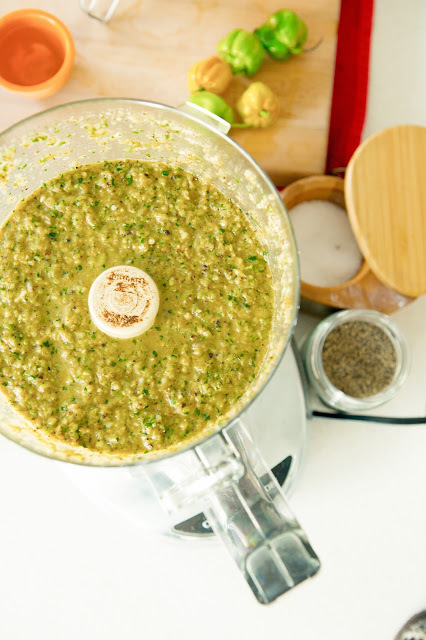 Starting with the lesser amount of peppers, add everything except the chicken to the food processor (or blender), and process until ingredients are evenly chopped and you have a salsa-like consistency. Taste mixture, and continue adding peppers to achieve desired spice level. (It should be pretty spicy with a healthy kick at the back end.) Add more salt or pepper if needed, to taste. Gently loosen some of the skin from the chicken and score meat with a small paring knife. Place chicken pieces in a large baking dish and pour marinade over the top. 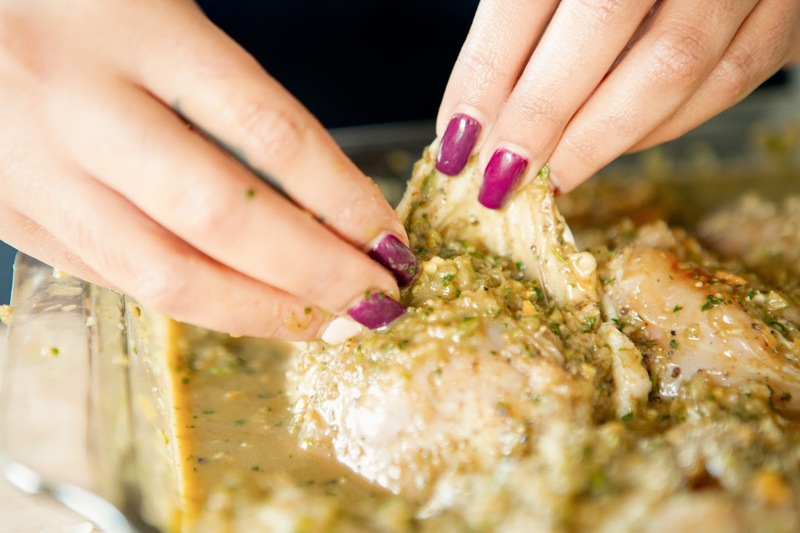 Using your hands (wear gloves if necessary), massage the marinade over the chicken, making sure to get some under the skin. Cover and refrigerate at least two hours, but preferably overnight. When ready to cook, pre-heat oven to 350 degrees. Bake chicken skin side up in the marinade (you can use same dish it was marinating in) for about 30-35 minutes. Meanwhile, light grill and bring it to medium-high heat. 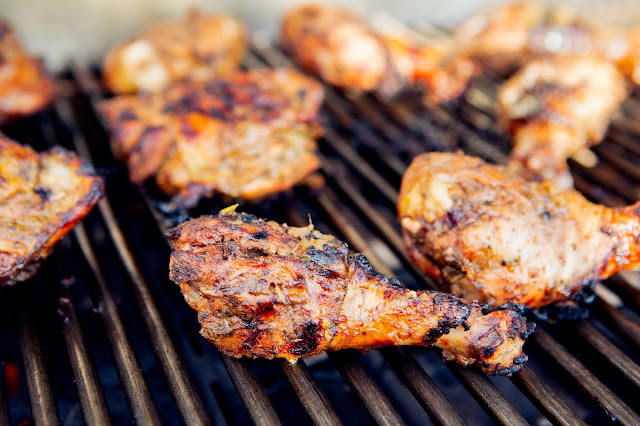 Remove chicken and grill for 10-15 minutes, basting with the marinade, until there is a nice char on all sides and internal temperature reaches 165 degrees. Serve with rice & peas and enjoy! *Alternately, if you don't have access to a grill, you can broil on high following the initial bake time to achieve a little char. OR you can omit the oven completely and do grill only, making sure chicken reaches 165 degrees internally and skin is crispy and charred. I’d take a good rice and peas recipe! I’ll try to add it tomorrow! 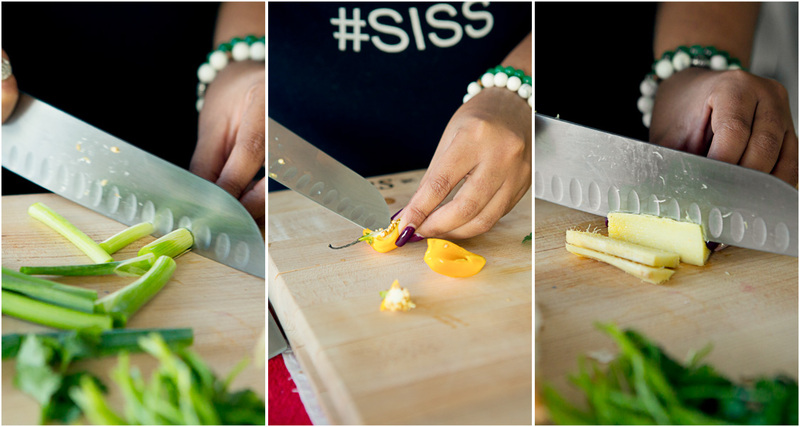 Looks good and I like the homage to the Jamaican flag with the scotch bonnet slices as garnish. Have fun down in Jamaica! Thanks Brandon, I appreciate the support! Just put my chicken in the fridge to bathe in the marinade overnight. Cannot wait to try this tomorrow. Thanks so much for the recipe! I saved some of the marinade for the smoked wings I’m going to make for the Super Bowl! Yummy!! Can’t wait to hear how it turns out! I just put my chicken in the fridge to bathe in the marinade overnight! I am seriously so excited to try this tomorrow! Thank you for sharing. I also made extra marainade to experiment with on the smoked wings I plan on making for the Super Bowl. Cheers!